Yesterday, we had a chance to take a spin in the brand-new Ford C-MAX Energi at an event in San Francisco. We had generally good impressions of the Focus Electric we tested back in April, so we were looking forward to seeing what the company's first-ever plug-in hybrid had to offer. We'll say up front it uses the same Sync with MyFord Touch dash we've seen in other Ford vehicles and the MyFord Mobile app is mostly unchanged from the one we saw when we tested the Focus Electric, so there's nothing new there. For everything else, however, take a peek after the break. It's clear the Detroit automaker is going after the hybrid juggernaut that is the Toyota Prius plug-in hybrid with this one. The C-MAX Energi comes out swinging with specs like 100MPGe (108MPGe city / 92MPGe highway), 195 net horsepower and 85MPH top speed in pure EV mode. Ford boasts the Energi delivers 620 miles on a tank of gas and 21 miles if you decide to go electric-only. It has a 2-liter DOHC 16V Duratec engine and a 7.6kWh Advanced Lithium Ion battery (the regular C-MAX hybrid uses a 1.4kWh battery instead) that unfortunately takes up quite a bit of room in the trunk. You'll be able to tuck in a few groceries from the farmer's market in there, but a trip to IKEA will likely end up with you opting for delivery instead. Since the C-MAX Energi is more than just a regular hybrid, you can choose one of three different driving modes via an EV Mode button on the center stack. The Auto EV mode is essentially electric-only most of the time unless you're standing on the gas -- in other words, if there's a demand for more power. As Ford spokesman Paul Aldighieri explains in our interview, "As long as your power demand is less than that threshold, then the engine is going to stay off." EV Now shuts off the engine completely (the car might nag you to turn on the engine if you're gunning the accelerator), while EV Later conserves the battery power for later use. 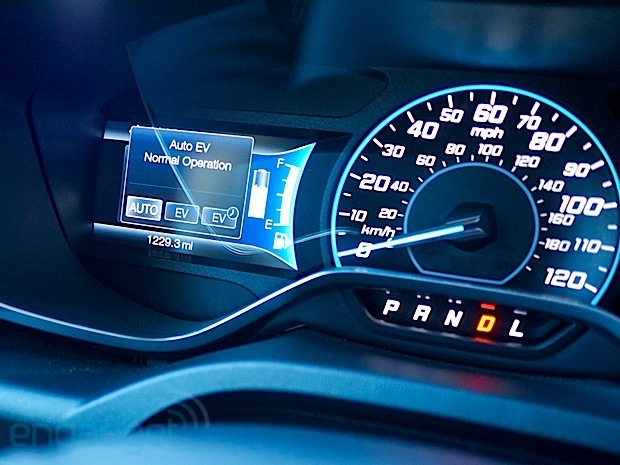 The SmartGauge display lets the driver know whether or not the engine is engaged (blue when it's off, red when it's on). There's a Brake Coach feature on the left cluster, while the right cluster is home to an image of green leaves that represents general fuel efficiency. In our brief road trip around the Embarcadero in San Francisco, the C-MAX Energi felt comfortable yet zippy. In electric-only mode, the car's silence seemed unnerving at first but that feeling soon faded. We enjoyed the gentle hum of the all-electric experience, especially in areas with slow traffic where power isn't necessary. Yet, there were instances where the handling felt a little soft, and verged on the appliance-like feel of the Prius. When we engaged the engine, the Energi felt just like any other gas guzzler out there, with a roar and rumble familiar to most drivers. From our few minutes in the driver's seat, the C-MAX Energi certainly felt edgier than the Prius, but not quite as satisfying as the Focus Electric. Of course, we'll need to do a proper test with the C-Max Energi to get a full feel for the vehicle. Watch our video interview with Aldighieri, a brief video tour of the car and get a closer look at the Energi in the gallery. The 2013 Ford C-MAX Energi is priced very competitively at $33,745 ($29,995 after federal tax credit).